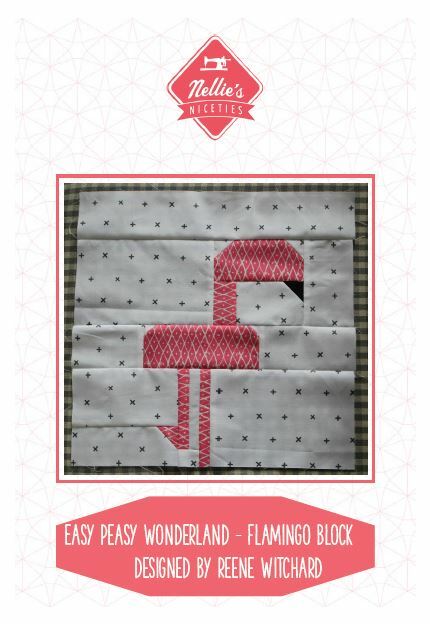 Introducing the Easy Peasy Wonderland - Flamingo block pattern. Reene has designed this block to be very quick and effective for a single project or used in multiples to create a stunning quilt. There is no foundation piecing and the block is designed to be chain pieced to speed things up when making multiple blocks. The Easy Peasy Wonderland - Flamingo block pattern is made up of a simple but effective 12" (finished size) flamingo block. The Easy Peasy Wonderland - Flamingo block pattern is in pictorial format so there is very little written instruction, as such it is suitable for people with at least a basic knowledge of patchwork techniques. Our pattern testers have all enjoyed the pictorial format and have found it very straight-forward to follow, we hope that you will agree. A single Flamingo block would make a great starting point for a small project such as a cushion cover or mini-quilt or you could use multiples to make a larger project. Alternatively you could consider adding other blocks from our Easy Peasy Wonderland block collection: Eat Me, Drink Me and Top Hat.